Eugenic Archives: "Notes on the history of the Eugenics Record Office"
"Notes on the history of the Eugenics Record Office"
Notes on the History of the Eugenics Record Office, Cold Spring Harbor, Long Island, New York The sequence of (A) Managing authority; (B) Direction of scientific and administrative work; and ( C) Source of support and budget-amounts; from its establishment October 10, 1910, at Cold Spring Harbor, to December 31, 1939 (date closed for inventory) - 29 years, 3 months. (a) "The Harriman Period," October 1, 1910 to December 31, [strikeout]1939 - 22[end strikeout] years. (b) "The First Carnegie Period," January 1, 1918 to December 31, 1939 - [strikeout]22[end strikeout] years. 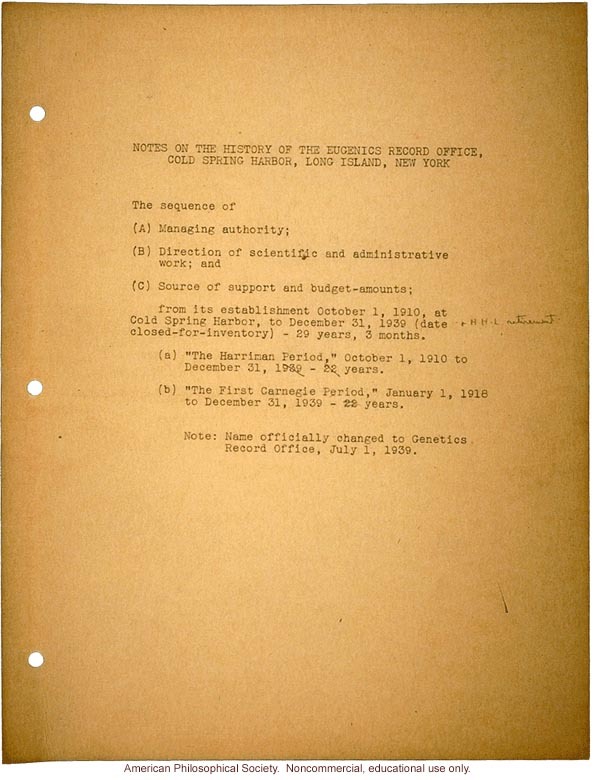 Note: Name officially changed to Genetics Record Office, July 1, 1939.